Skype – one of the most used desktop applications had already evolved when it revealed the 10 way group video calling feature in Skype 5.0. This time it has come up with another major update. So it’s time for users, whose cell phones are powered by Android to cheer up; as Skype has stepped into the Android Market. This new app would work perfectly on most of the Android based phones. 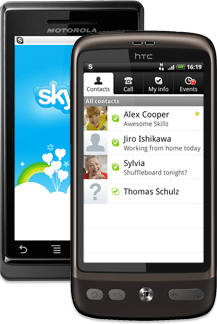 You can easily download the Android app by visiting skype.com/m from your Android based mobile phone. It will automatically detect your phone’s OS & check whether it’s Android or not and you will be provided with a suitable download link. The minimum requirements for getting this app is that, your Android OS version should be 2.1 or higher. You can make Unlimited Skype–Skype calls for free on your Android phones. But take a note that you will be charged for using GRPS at your Subscriber rates. So Skype recommends us to use it on WiFi zones. Though such zones are common in US, UK, etc. But in India you won’t find them at many places. So you need to pay the nominal GPRS charges. Check the video below for info about the working of the Skype on Android based phones. If you are an Android user, just grab this awesome app. It will help you to extend your working/consultation hours. Is Android Growing bigger or Skype ? Write in your views using the comments form. Very interesting article, I have just written about the new release of Skype for Android and how it could be the end of Mobile Service Providers… let me know what you think? That’s a good news for the Android users, I am sure that this application will get a lot of downloads in a very short time span. Correction – It will help you to extend your working/consultation hours. Glad u liked it Uma. I have promoted your post! I once join a website that had meebo on it and he almost freaked thinking it was msn. But then again my dad’s not keen on the idea of me having friends.